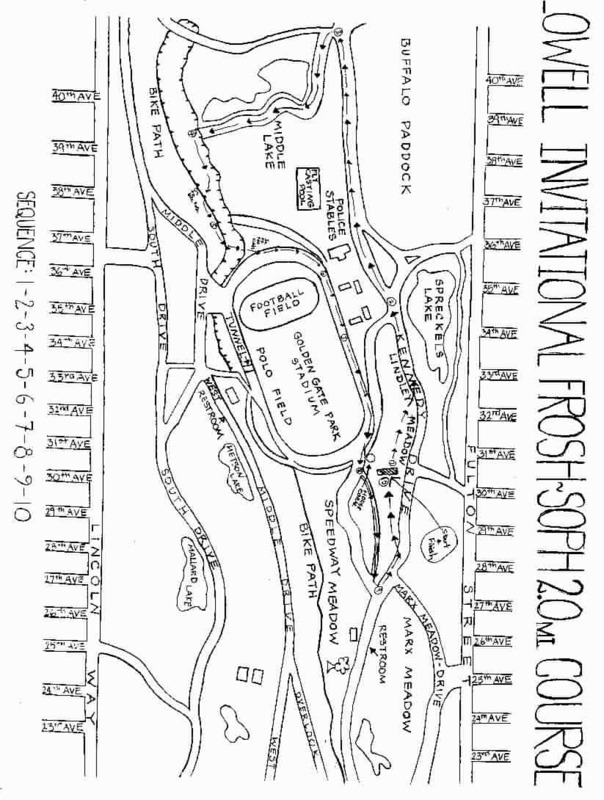 The 33rd annual San Francisco Cross Country Invitational Meet will be held on Saturday, September 17, 2005 at Lindley and Speedway Meadows, in Golden Gate Park. This will mark the 27th consecutive year that Lowell High School has sponsored this meet. 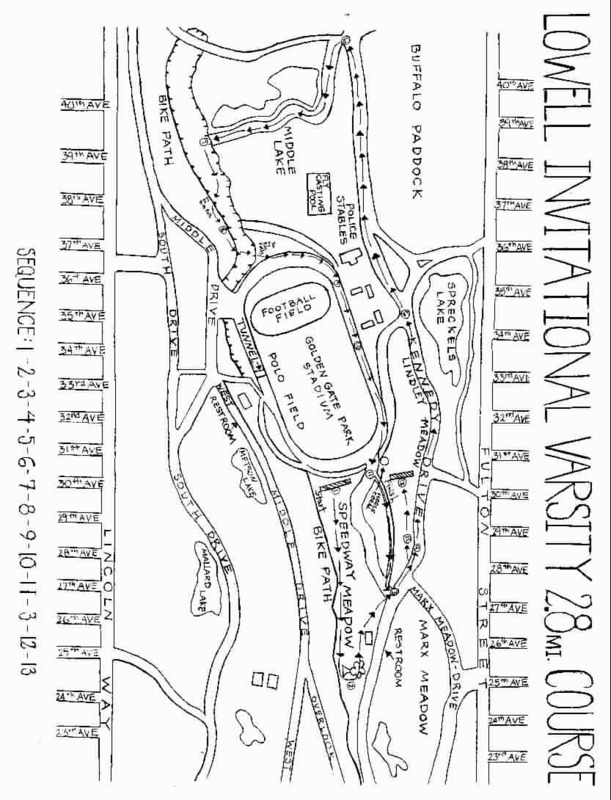 There will be three races for girls (Frosh/Soph, Jr. Varsity and Varsity) and four races for boys (Freshmen, Sophomore, Jr. Varsity and Varsity). The distance is approximately 2.8 miles for Varsity & J.V. races and 2.0 miles for Frosh/Soph races. We will run the same basic courses that we have been running since 1993 (maps enclosed). The number of races and distances may change based on the number of teams attending and other circumstances beyond our control. This meet is traditionally a low-key meet and we welcome all teams regardless of their size or experience. We have gone to computerize results. Every school that plans to attend must submit a roster by e-mailing a Microsoft Excel spreadsheet document as an attachment to an e-mail. Please include every possible runner that may be coming to the meet. You do not need to declare which race an athlete will run. Deadline to enter the meet and submit your roster will be 9:00 PM Thursday, September 8. Each School's roster will be posted on www.recordtiming.com. Schools that meet the first deadline will be allow to make changes to their roster. Corrections and additions can be submitted up to 7:00 PM on Wednesday September 14. Race day entries will be at the discretion of the computer operator; however there will be a $5 per name charge in addition to the regular fees. On the next line, whatever the number, please place the following information into the appropriate column. There will be seven medals for each winning team. Individual awards are for members of non-winning teams with no more than seven individual medals going to members of the same team. Please note that the J.V. Girls will be before the Varsity Girls race. Please try to run only seven runners in the Varsity divisions, however because our meet is an early season event and coaches have used our meet to establish their top seven in the past, this is not mandatory. A Varsity team must be entered first before a J.V. team can be entered. Teams will be subject to disqualification if they have faster runners on their J.V. teams. There are no dressings facilities so please come dressed to run. We plan on having souvenir tee shirts for sale again this year. All entry fees should be received by the day of the meet. Coaches whose school has a history of late payment will be asked to leave a personal check or their school will not be allow to run. A late fee of $25 will be charged if payment is not received by September 30. If you have questions, please e-mail me at coachaleong@hotmail.com, or leave a message at 415-759-2730, extension 3853.